When planning your trip, consider the needs of everyone in your group. Choose a trip based on the level of difficulty, the ages of the participants (particularly children), each person's physical condition, length of trip, and the type of raft (paddle, paddle-assist, or oar) you prefer. If your group has a wide range of interests, it is possible to divide into smaller groups and run two or more sections of the river at the same time, accommodating everyone with their own level of splashy fun. 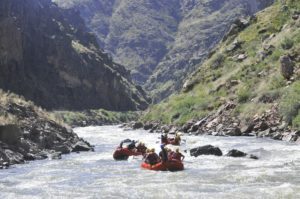 It is not necessary to know how to swim in order to go rafting, nor is previous experience required to raft the Royal Gorge or the Intermediate Clear Creek trip. The number of guests per raft varies with water levels, but is usually between 5 and 7 guests. A buffet lunch is provided on all full day trips as well as on packages. You can add on lunch to any half day Arkansas River trip for an additional $10 per person. 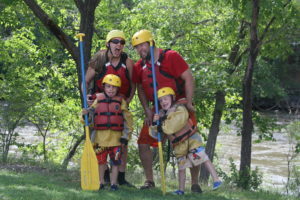 The Family Float on the Arkansas river is perfect for children between the ages of 1 and 4. The Bighorn Sheep Canyon of the Arkansas River and the Clear Creek Beginner trip in Idaho Springs are family-friendly trips geared toward adults and children ages 5 and up. The Royal Gorge section of the Arkansas River and the Clear Creek Intermediate trips are for guests ages 14 and up. These trips are action packed and full of adrenaline. Full day as well as multi-day trips are appropriate for ages 5 and up and you can always add on more adventure to any of these trips with the Royal Gorge add-on. When you are ready to make your reservation, you may book online or call our office at 719-275-6645 and one of our friendly reservationists will be happy to assist you.